When the eggs on Miz Fannie Mae's Easter hat begin to hatch in church the congregation proclaims a miracle. The birth of baby birds from Fannie Mae's hat becomes an Easter miracle to inspire her congregation and her family. 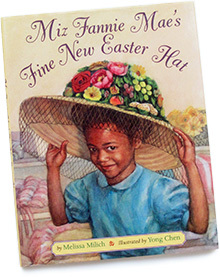 This historical tale centers on a miraculous Easter hat, but it's the unique characters that really bring it alive. The heartwarming family includes a young daughter who so carefully picks out the hat, a father who destroys the hat in by wearing it on his milk route, and a mother who gives up her coveted hat to become a nest when the eggs on it hatch. Despite one noticeable incongruity between the written text and the illustrations, they do provide vibrant details that give the characters and setting a rich and realistic appeal. A truth-is-stranger family story from Milich (Can't Scare Me!, 1995, etc.) and newcomer Chen. The daughter and father in a rural black family travel by horse-and-wagon 25 miles to the big city to buy the mother an ornate hat for Easter Sunday. At home, Mama deems it too expensive and puts it aside to return. When Daddy wears it on his milk route the next morning, he tells her the hat has been worn, and she must keep it—a fact that doesn't entirely displease her. She wears the hat to Easter service, where four bird's eggs on its brim hatch during the sermon. The babies' mother has apparently followed it from town to rear the babies, and the whole congregation is caught up in the miracle. At home, Mama places the hat in the branches of a tree. Although the jacket copy makes reference to the truth of the tale, readers will find it farfetched and long-winded. Chen's portraits are often graceful, occasionally awkward, focusing on people, leaving the landscape and interiors as little more than sketches. The faces almost uniformly wear smiles, rendering the book one-dimensional with its glowing good will.